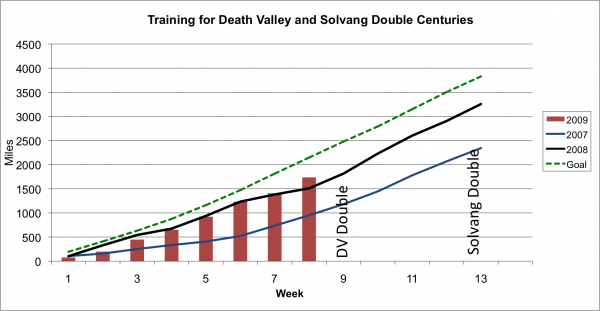 In a prior post I reflected how I thought I was climbing much slower than last year. But then my son pointed out that my time on Saturday up Mt. Diablo would have put me in 3rd place for men 60+ in the Mt. Diablo Challenge race last fall. I do almost all my cycling with a double crank. Although I have put on a 12-27 cassette, it does not seem quite enough on some of the real steep hills. Sure I am able to make it up every hill, but when the grade gets too steep, my cadence really dips. If a pro cyclists goes up in a 39/21, with their speed of travel, they may have a cadence of over 80 rpm. 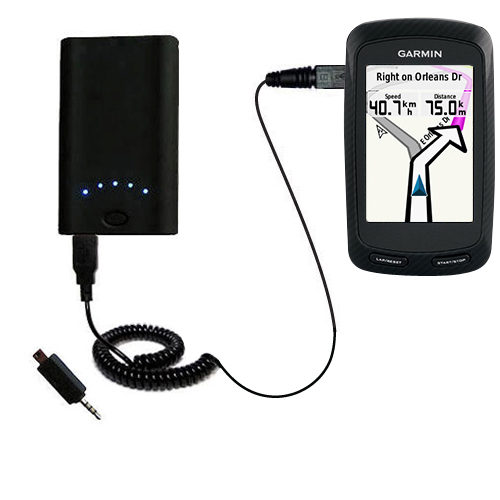 It has been shown that while climbing, a cadence of 80-90 will result in a faster climb time. 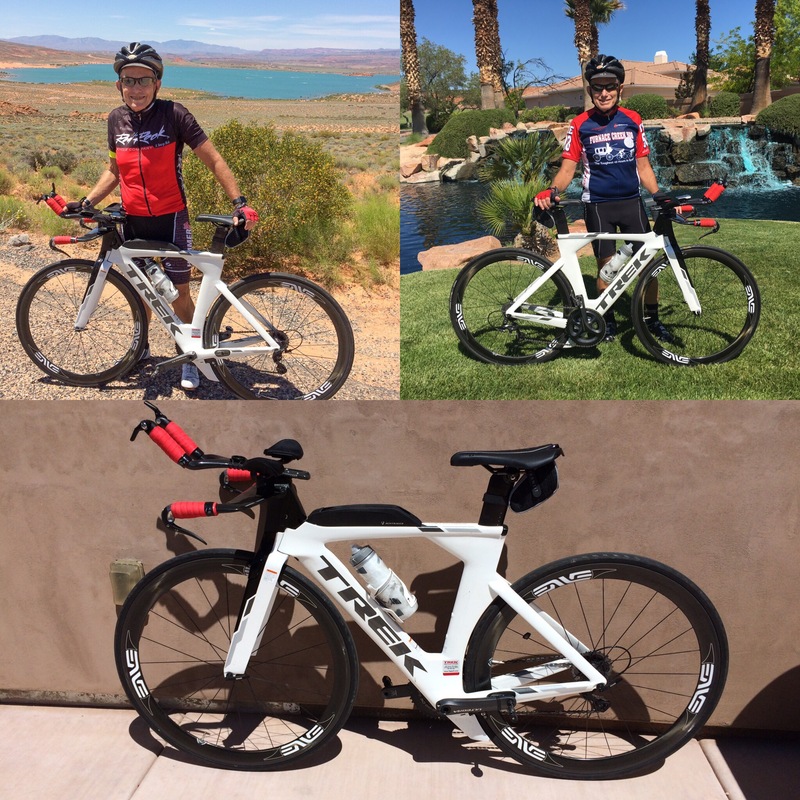 The slower you climb, the lower the gearing you need to keep that type of cadence. It is time I move to a compact crank. With the ability to use a lower gear that will give me the option to remain seated more. I know when I stand my heart rate climbs. Although I find standing frequently a help with my legs, too much standing would not lead to the best time. Last Wednesday I did a climb up Henry Coe with some cycling buddies. Fairly early in the climb I was taking the pace up to see who was going to be able to hang with me. My pulse rate was now over 170, well above my lactate threshold. Since one other rider kept up, I had no choice but to keep the pace to see who would last the longest. He finally dropped off the back but I had to keep driving long enough to form a gap. But by then I was too expended and my overall time suffered. I was surprised at the end of the climb that he was only a minute behind me. 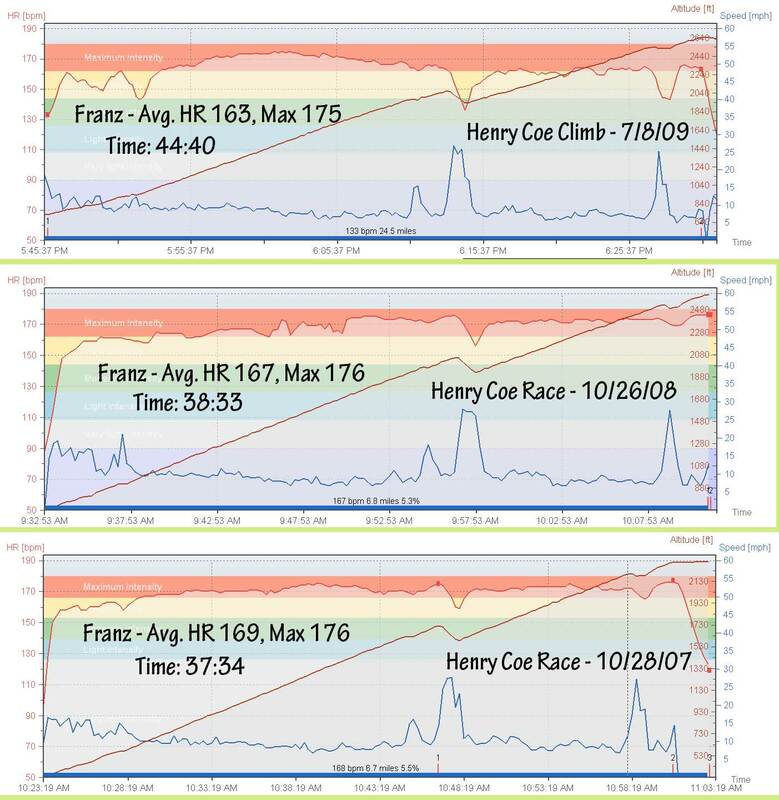 You can see this on the attached series of charts, the top one being last week and the other two from an actual race on the same climb during the last two years. Click on the chart to view enlarged. Of course I would never expect my time on a ride with some friends to ever be as fast as an actual race where I make sure I have fresh legs and I give it all I have for just that one climb. However I feel that if I had kept my heart rate down a bit earlier in the climb and then took it up late in the climb I would have finished faster. 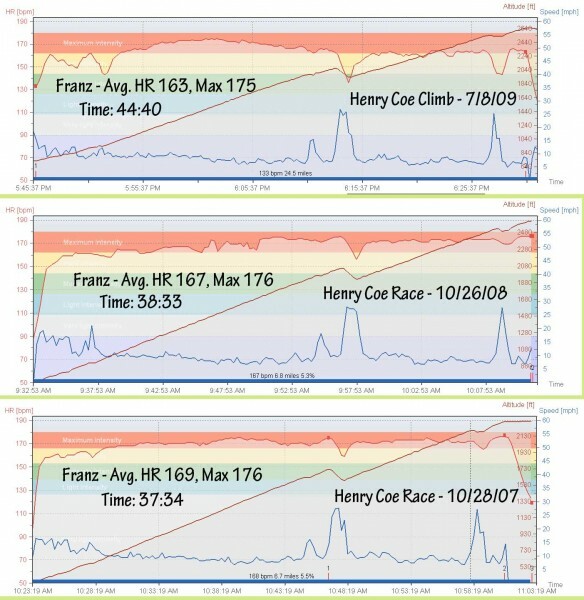 One thing I have done in the past is doing some speed work, both intervals on the flats and hill repeats. 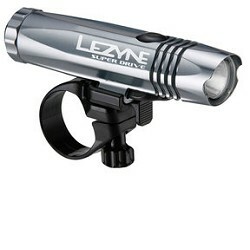 That is significantly improved my performance on a long climb. 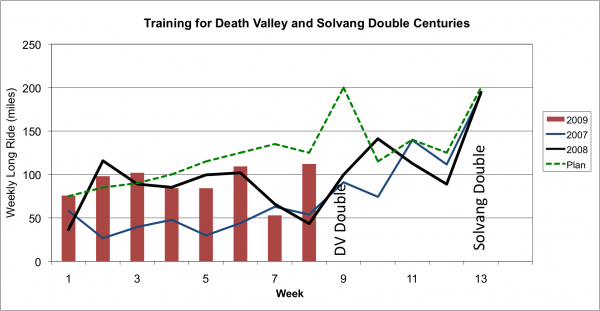 Although you get some benefit of just climbing certain hills at a hard pace, one should not ignore the benefit of repeats, with short recovery periods in between. See my article on speedwork. 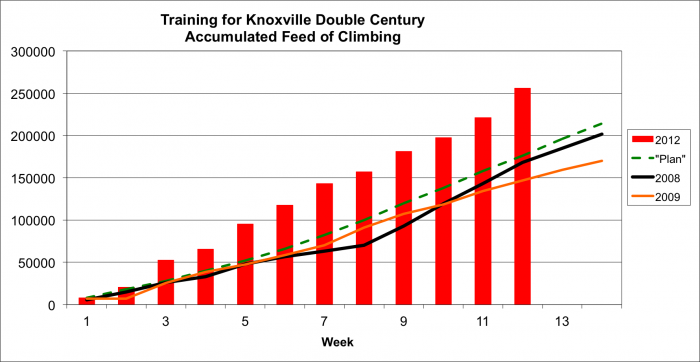 When I was training for marathons, it not only kept my weight down, but I believe it made me a faster climber. I started to get out of running for the most part over the last year, due to some issues with my knees. But I met a guy on our 10 day bicyle tour who also ran the Boston Marathon and he gave me some information one what was causing my problem so I started some exercises to stretch my IT band. The issue seems to be solved so I have been increasing my running again. Yesterday I did a 4.5 mile run, with 3 miles at a tempo pace. On those three miles I was averaging an 8 minute pace. Not very fast considering I use to run a marathon at a 8:20 pace. However it was fast for my conditioning because I woke up this morning with sore legs! Although I don’t plan to run a marathon again anytime soon, I do plan to take my running back up to at least 25 miles a week and add in some interval training. All cycling and no running makes Franz a dull boy. The Death Valley Double is this Saturday. It has been difficult to get ready for a double century that takes place so early in the year. With vacations in November and December I was not able to really get much biking in until January. Two weeks ago some of our kids and grandkids were visiting and I wanted to spend more time with them. Then this February had many rainy days. Last week I was finally able to get in a lot of miles, over 350 of them. I did a long 112 mile ride last Saturday. I felt like a slug because it had a lot of climbing, but I did make it without much stopping. 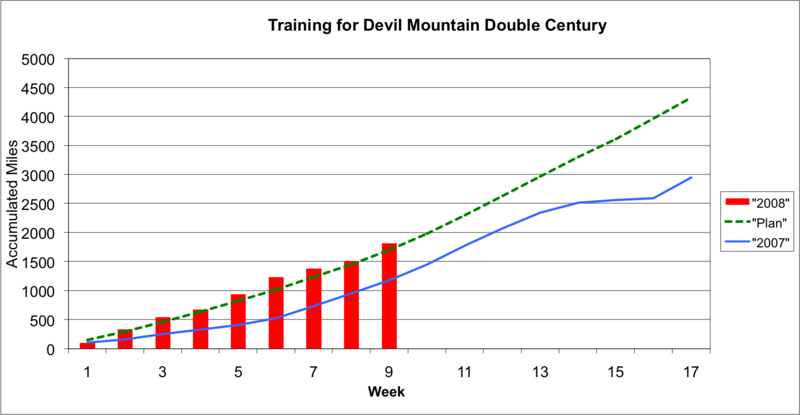 Although my accumulated miles so far this year are not quite what my training program called for, it is higher than the last two years. I was not able to get in a real long ride, like 130 miles, but I did some long rides on Thursday, Friday and Saturday that hopefully accumulated had a similar effect. You can see on week 7 that I was only able to get in a 52 mile ride, but at least on last week I got closer to my training plan. As I mentioned, I felt like a slug on Saturday. When I looked at my average speed over the 112 miles, it was not too bad considering the 8,700 feet of climbing. In my training log I have a lookup table that shows my overall effort when I consider average speed, climbing and total distance. By averaging 14.7 mph, I did get a “fast” grade for the ride, even though I could not keep up with the lead riders the second half, as I could last year. Today it was raining all morning. I had already taken a day off yesterday so I felt I needed to get back on the bike. I went to the bike shop and bought some fenders to put on my old bike and then headed out to do some interval training. It took me so long to get the fenders installed that the weather had cleared and the roads were mostly dry. 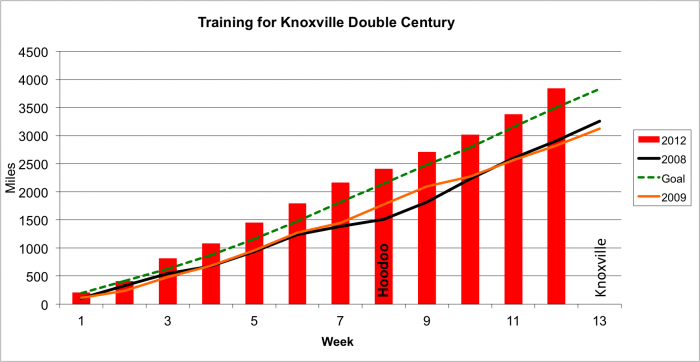 I have a course for interval training and measured how I did compared with similar training last year. I could not find my heart rate strap so I was missing that data, but overall I did okay, although not quite like last year. It is a circular route so only the total can be compared with the winds different each time I do it. 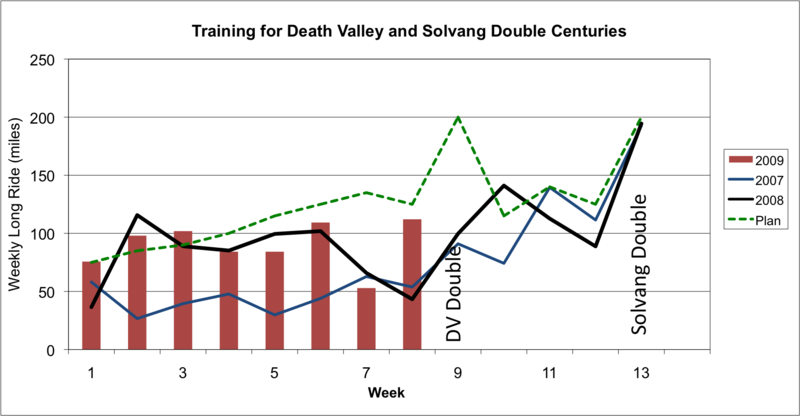 I have finished my last week of biking training for the Solvang Double Century, which will take place next week. 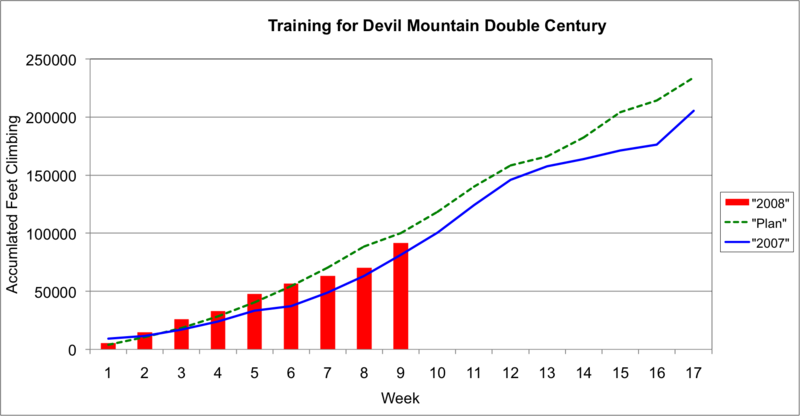 My main focus is on the Devil Mountain Double Century at the end of April, so my training program has been geared to prepare for that. 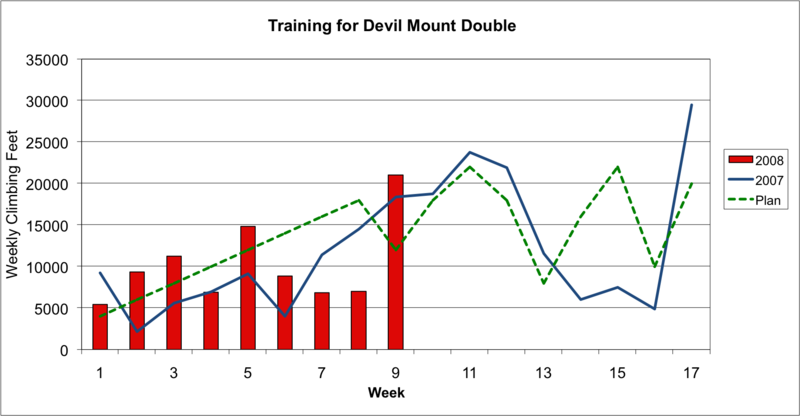 I have doing well on the training, although this week was a bit below plan. I will climb Henry Coe 5 times this week so I am getting a lot of climbing in. 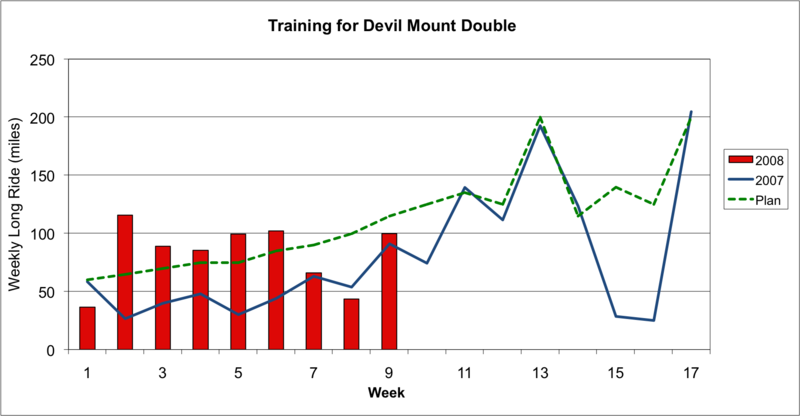 This chart show my weekly miles this year compared with last year and against my plan. But my climbing is doing well. See all the charts here. It is almost D day for the Furnace Creek 508. Because I have been tapering significantly and no biking today or tomorrow, I get a bit worried about losing conditioning. But I know I need to take the days off to be ready. 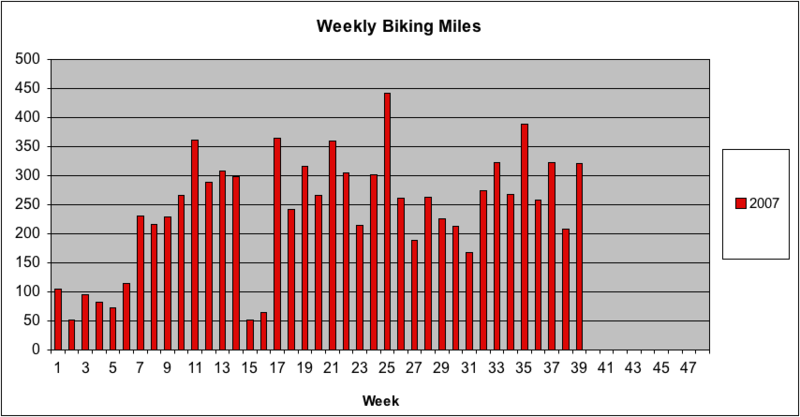 I looked at my weekly biking miles through last week. I was able to get in over 300 miles last week. I guess it is ready or not!